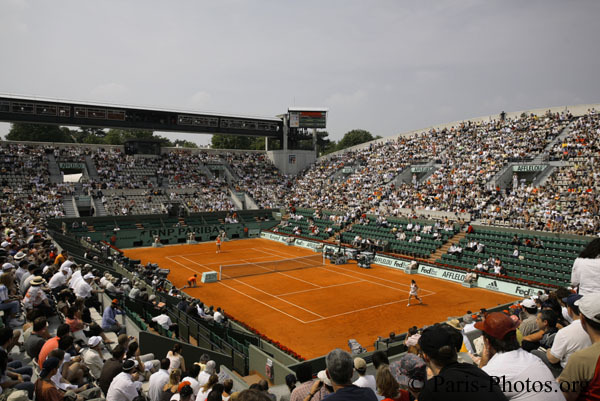 Roland Garros, also known as the French Open, is a major tennis tournament held over two weeks between mid-May and early June in Paris, France, at the Roland Garros Stadium. 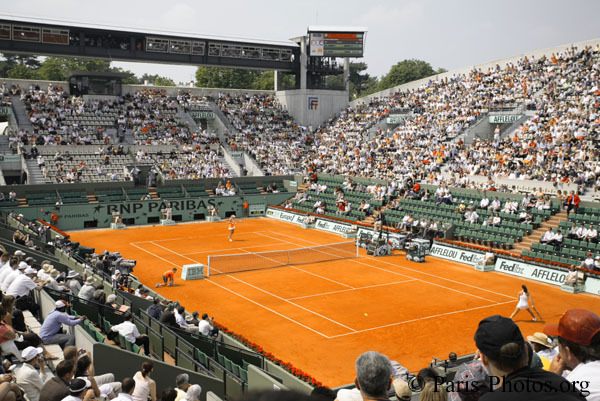 It is the second of the Grand Slam tournaments on the annual tennis calendar and is the premier clay court tennis tournament in the world. 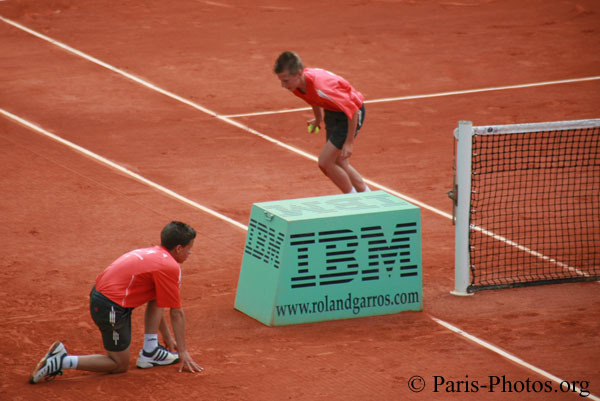 Due to this slow surface and the five sets matches without tie-break in the last set, Roland Garros is widely seen as the physically hardest tournament in the world. 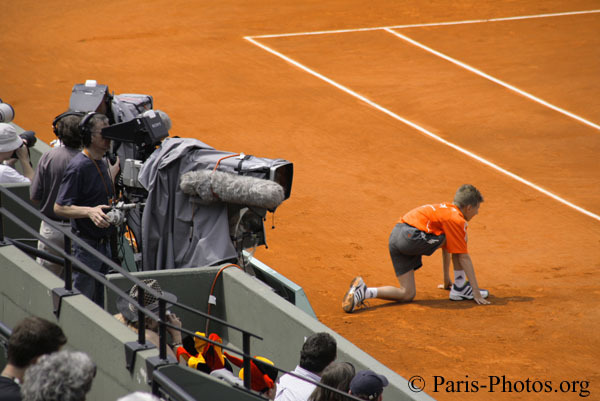 Those photos were taken on Tuesday June 5th, 2007, the day of quarter finals. 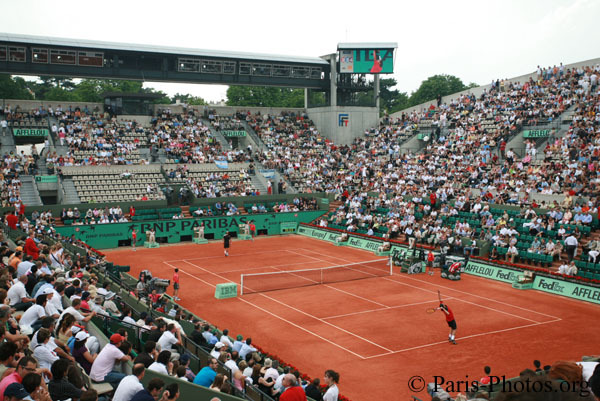 This the second biggest tennis stadium of Roland Garros. This picture was taken from the top Suzanne Leglen's step. Nicole Vaidisova is ready to receive Jankovic's service. They are trained, they are selected, it is an honour for them to serve the players. Walking in the alley, I saw those handicaped players. It is really amazing how they can play, it seems very hard since they have to deal with their chair too. 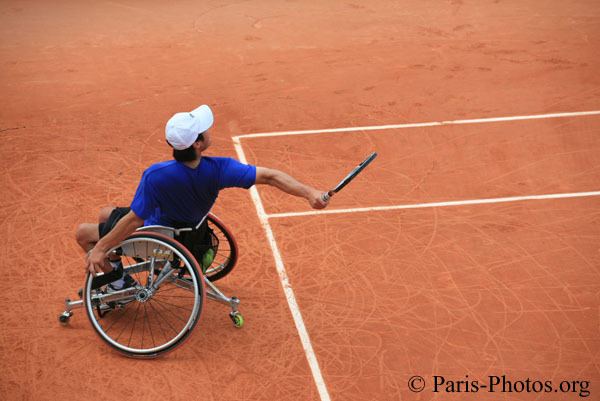 This year was the first time handisport becomes part of the French Open with prize money. In small tennis courts, players are training. 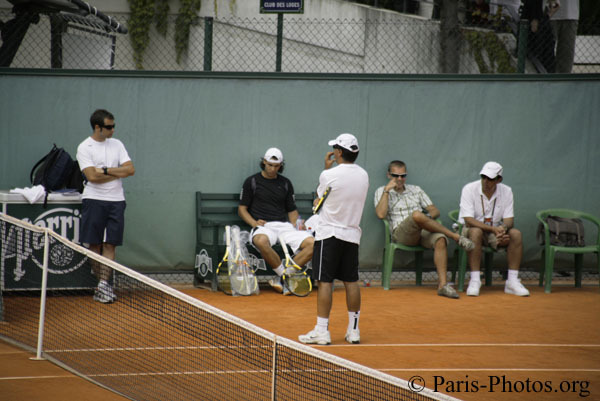 Here is the famous Spanish champion Raphael Nadal(in black t-shirt), the French Open last winner. Maria Sharapova, the Russian player was ranked n°2 int the list of world top players. She is tll and scream each time she shoots the ball hard. The Russian pllayer was ranked n°2 int the list of world top players. Anna Chakvetadze was the Russian oponent of Sharapova in the quater finals match. The stadium is very well equiped with camera, so that people in front of their TV won't miss anything. 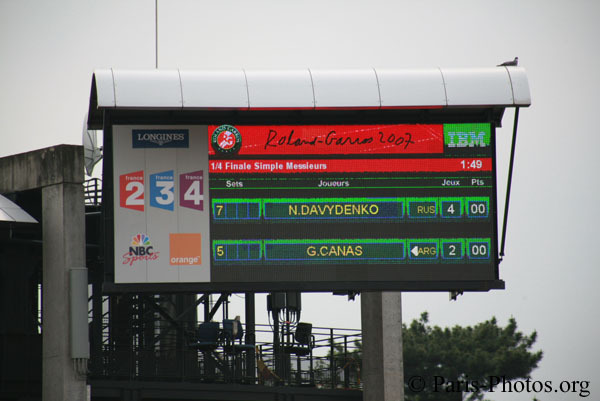 Still on Suzanne Lenglen's tennis court, it's a men's quarter finals match. 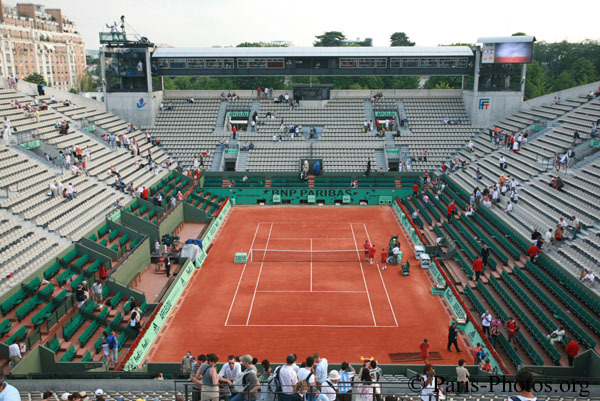 Used to be called Central court, the Philippe Chatrier is the main stadium ofRoland Garros, about 15,000 seats. 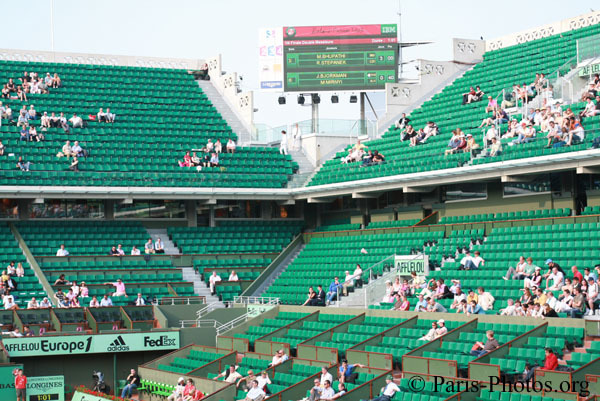 For the last match of the day, the main court was quite empty. Peple left after the men's single match with Federer. This match was scheduled on smaller court n°1, but was changed due to the availability of central court (Federer was fast!). 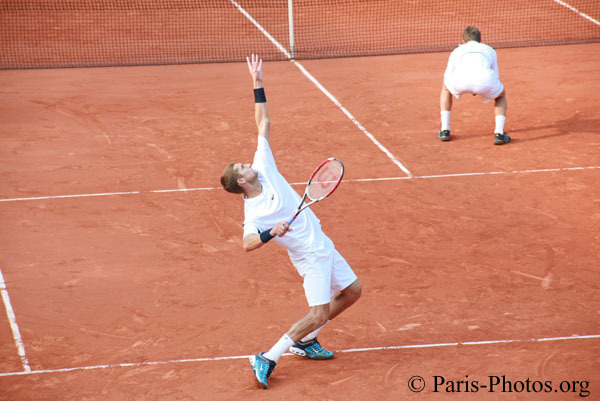 I call it the position of the frog... :-) Bjorkman is serving, Mirnyi is frogging. 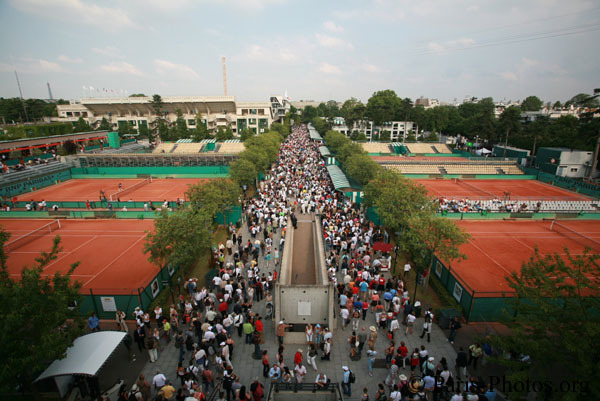 The round plazza between the Chatrier court and the court n°1 (the round one). 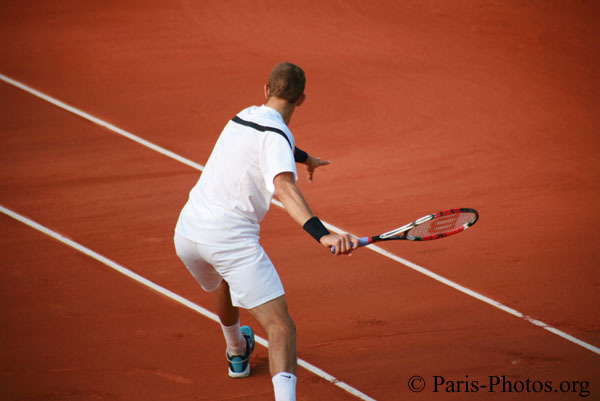 Officially the "Tournoi de Roland-Garros" (the "Roland Garros Tournament" in English), the tournament is often referred to as the French Open. It is named after its stadium, which is in turn named after the World War I pilot. 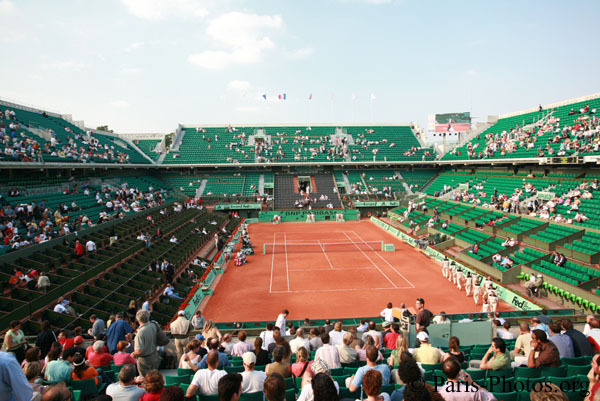 Roland Garros began as a national tournament in 1891. 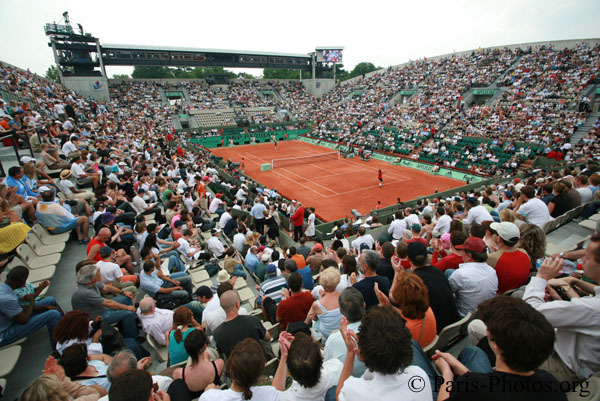 In 1925, the French Championships opened itself to international competitors with the event held on a grass surface alternately between the Racing Club de France and the Stade Français. 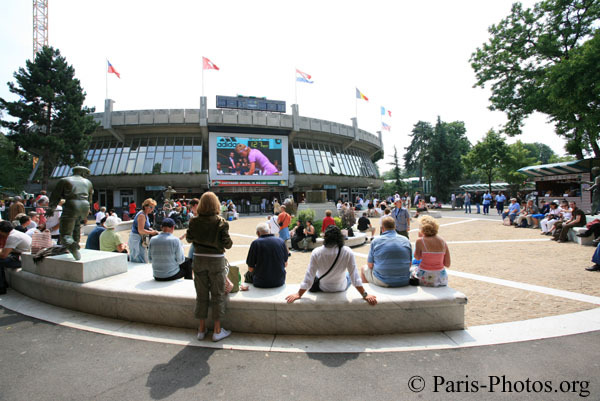 For the 1928 Davis Cup challenge, a new tennis stadium was built at Porte d’Auteuil. 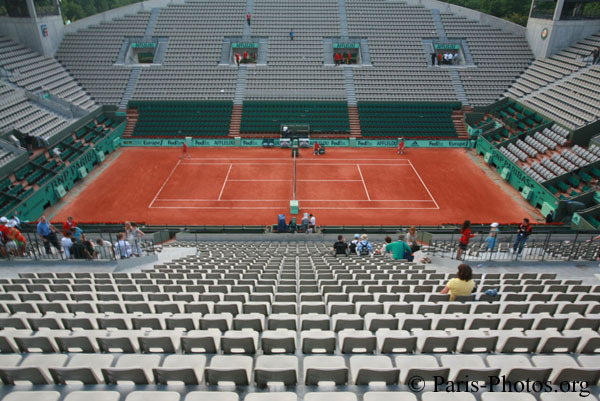 Named for a hero of World War I, the new Stade de Roland Garros, and Court Philippe Chatrier, was built with a red clay ("terre battue") playing surface. 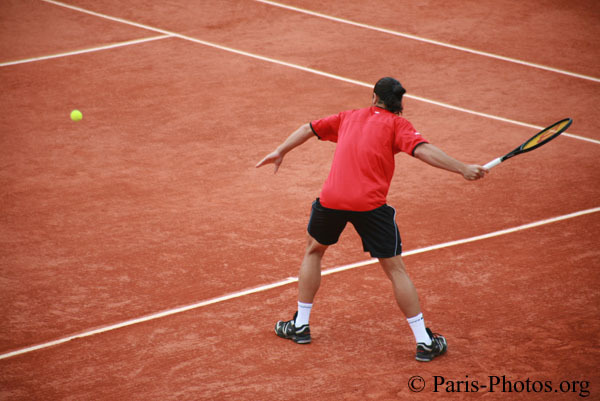 Clay courts slow down the ball and produce a high bounce when compared to grass courts or hard courts. 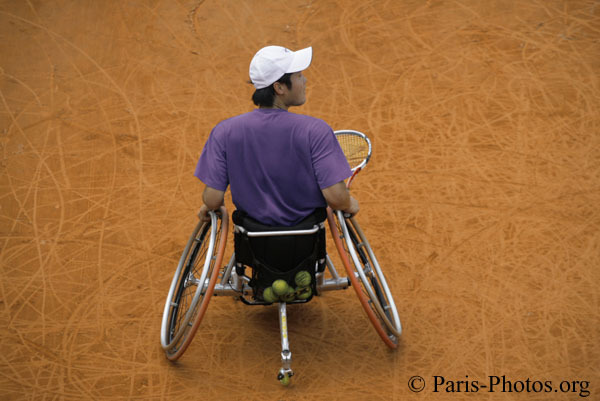 Clay court specialists have evolved who often succeed here while many higher ranked players struggle. Pete Sampras, who won fourteen Grand Slam singles titles, Roger Federer, the current World No. 1, and Jimmy Connors have won every other Grand Slam singles tournament but never the French Open. 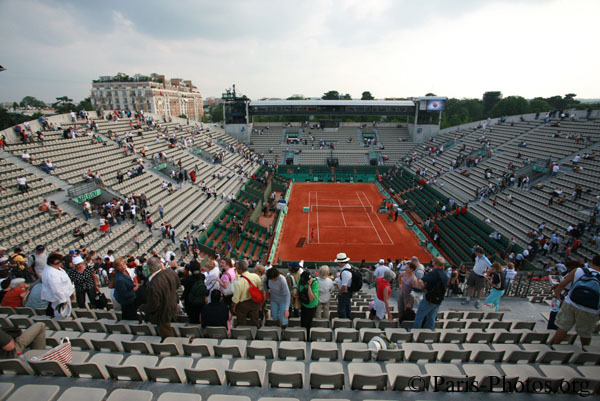 As of 2006, the last six French Open men's singles championships were won by men who did not win any other Grand Slam tournament, as were the last 8 of 9, 11 of 13, and 13 of 17. 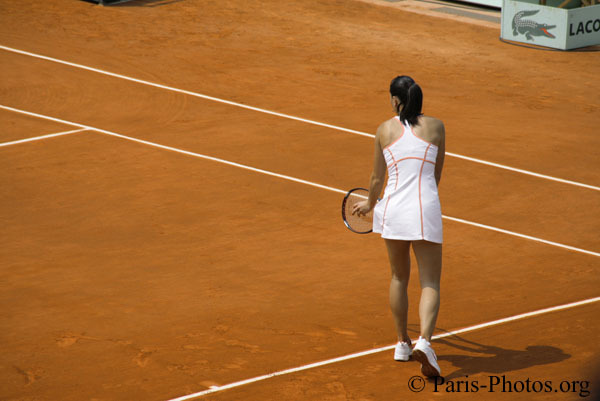 On the female side of tennis, Roland Garros is the title that has prevented players such as Lindsay Davenport from achieving a career Grand Slam, and in 1997, it was the only Grand Slam singles tournament that Martina Hingis failed to win. 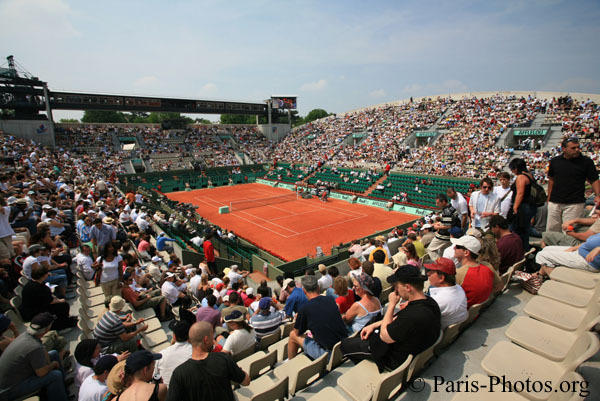 In 1968, the French Championships became the first Grand Slam tournament to go "open," allowing both amateurs and professionals to compete. 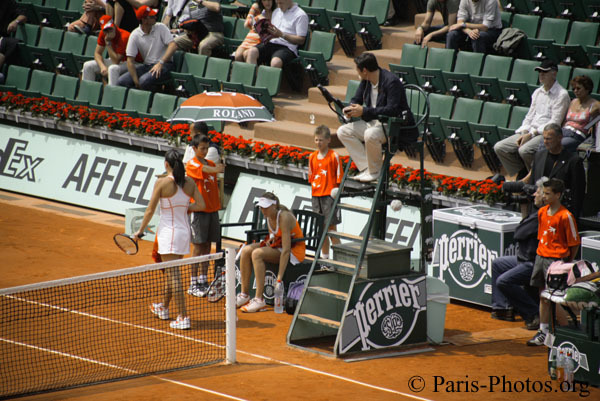 In March 2007, Roland Garros announced that it will provide an equal amount of prize money for both men and women in all rounds.